She Shed or Potting Shed? Which would you rather have? A she shed or a potting shed? Our side yard is big enough that we can add another shed on our property. Well, actually the side yard is an empty lot that we own and I’m toying with the idea of either a she shed or a potting shed. When I need inspiration I often turn to Houzz (click on the photos to see more of that project on Houzz). This luxurious she shed at Houzz made me do a double-take. It looks so serene and beautiful and I would love sleeping out here on starry summer nights. In the morning it’d be sweet to enjoy a cup of coffee and a croissant on the patio. The great thing about having a she shed, is that you can really make it anything that suits your fancy. For example, this shed serves as an artist’s studio. 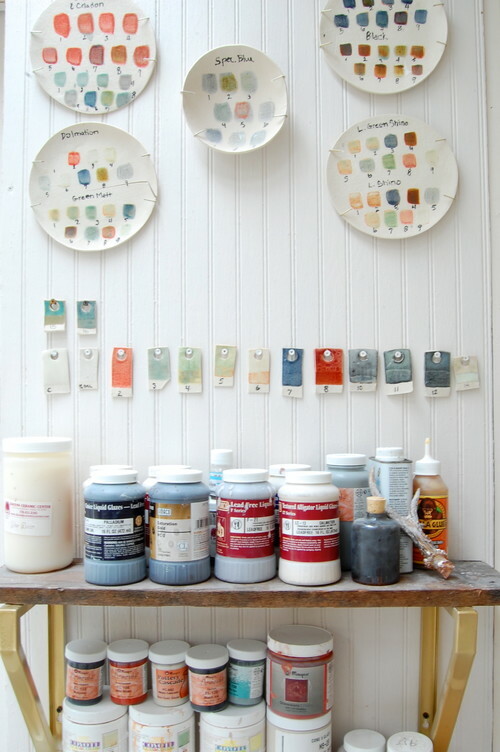 I could really use a crafting shed for all my projects that I make on the blog. Here’s an inside photo of the same shed. 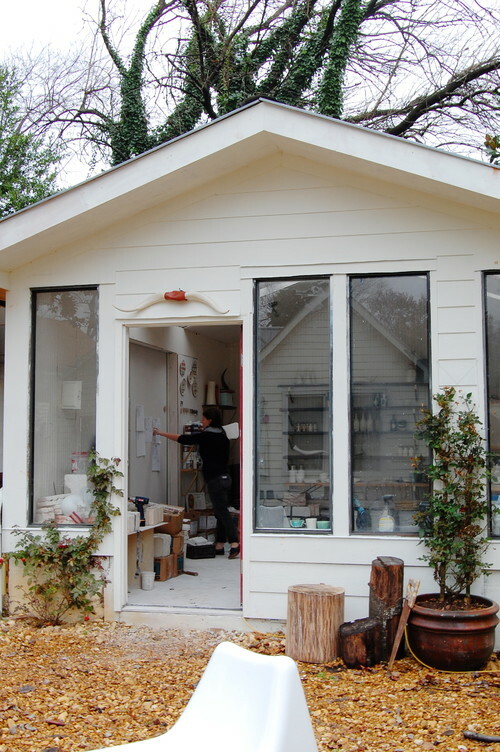 The owner makes ceramic projects in here. You’ve probably seen this adorable little she shed before. It’s all over the internet and I’m certain I’ve seen it in a magazine or two. Inside, you’ll find plenty of white, shabby chic charm. 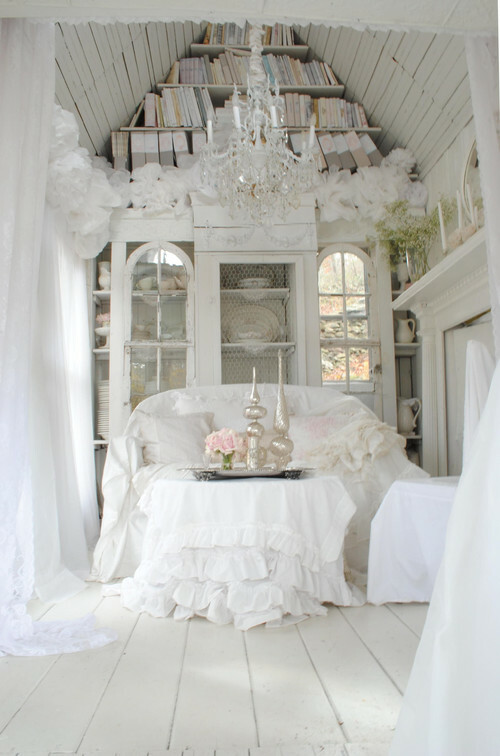 Crystals suspend from a painted wood slat ceiling while yards of ruffled white fabric adorn windows ad furniture. This little she shed is worthy of any Rachel Ashwell fan. 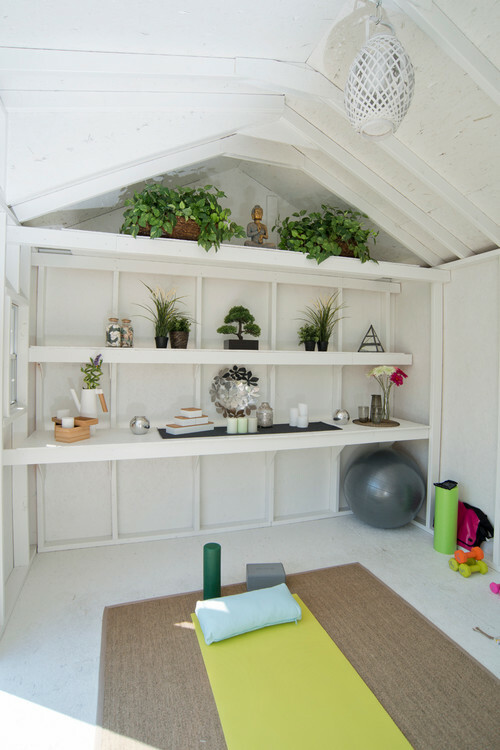 My daughter would like this yoga shed. She’s studying to be a yoga instructor and this is right up her alley. I like the door to this little shed. Handy hooks provide a convenient place to hang your hat or garden gloves. 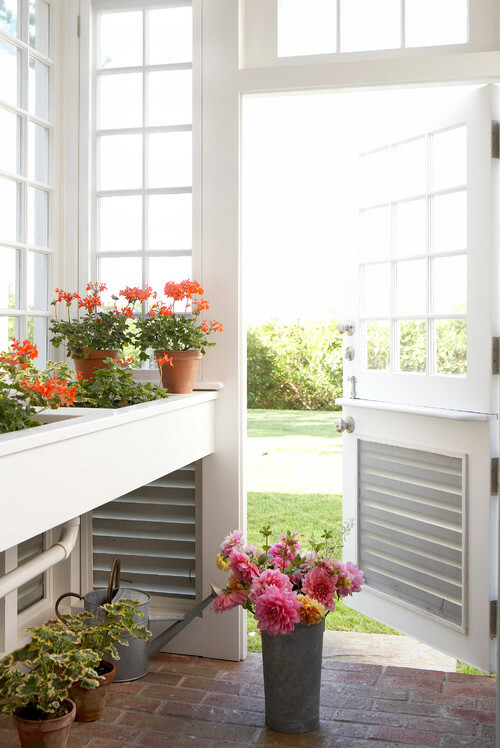 Moving on – you’ll find that potting sheds can be just as charming as she sheds. 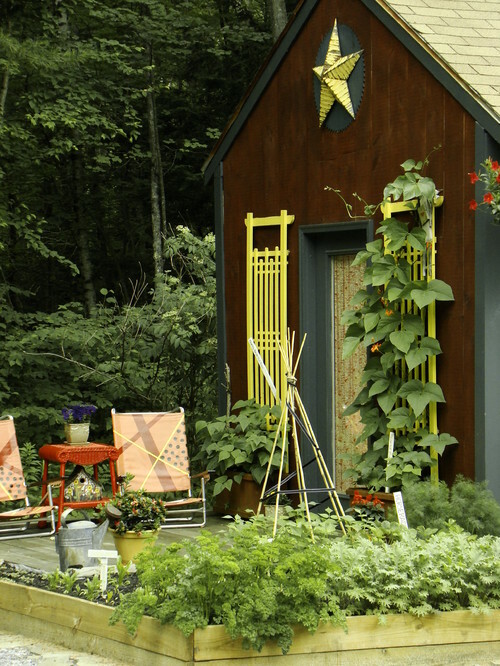 I love the garden space surrounding this farmhouse style garden shed. Whether you choose a she shed or potting shed, you can cultivate a garden like this one to enhance your shed. 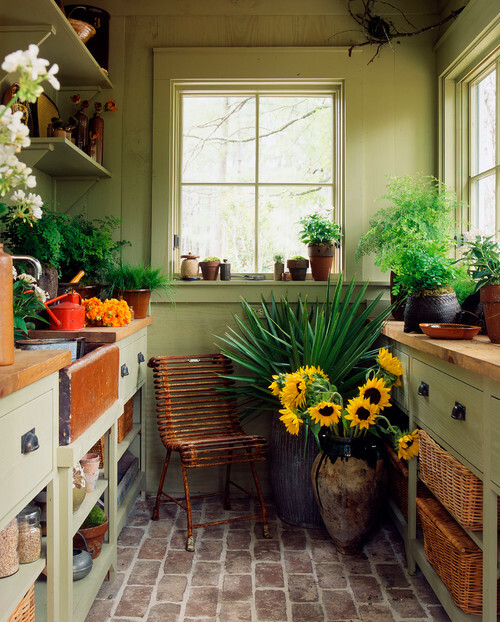 I just want to sit inside this potting shed and read a book or just reflect on my thoughts. It’s so peaceful and beautiful. Love the brick floor! And then there’s this pretty potting shed with ample windows for growing plants and flowers from seed. 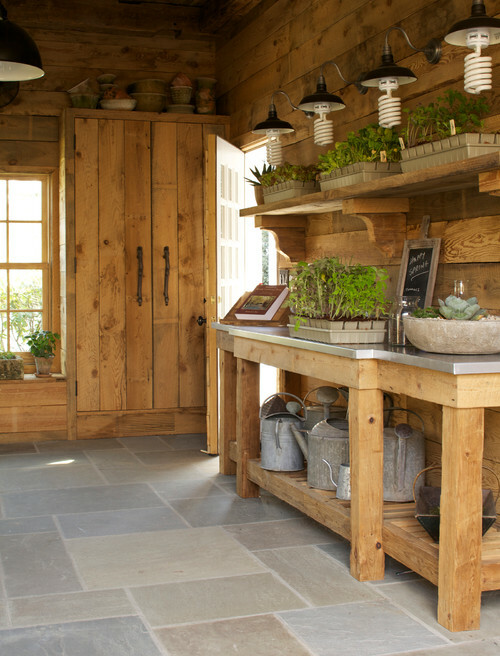 Photo by Dujardin Design Associates, Inc.
A rustic potting shed would also be wonderful to have in the yard. What would you choose? A she shed or a potting shed? I think I’d like to combine them into a potting she shed! I like both, but given that you live in northern Illinois, a she shed makes more sense I think. Definitely a combo. Have a corner to craft, a corner to read or relax, and maybe a counter attached to the outside for potting. I would love one! I live in Minnesota, where the long winter renders my shed useless to me for 6 months of the year. So mine is a combination: potting/garden/hang-out spring through fall, and then during winter it provides critical storage for patio furniture. It’s still a pretty little building to look at out my kitchen window when the landscape is snowy. I agree with your last statement. If you have the room and the budget, do both! The “She Grows” Shed. It’ll be an internet sensation! I choose the potting shed. All of them are so nice, but for my own personal use, it’s the potting shed. No doubt about it, I would choose a she shed! My grandmothers was called a Hot House. I haven’t thought of that in years. She Shed’s/Potting Sheds aren’t new. HeHe. Thanks for bring back some lovely memories. I loved your post. Oh, I would combine the two…..why not!!! I think I like your idea of combining them. I could paint and plant, put a comfy chair for when I needed to relax. I have been looking but haven’t found what I want yet. Thanks for the ideas. What an exciting project to work on! I love the idea of combining them, the opportunity to have a brick floor seems too good to miss! First off, I don’t like the term She Shed, but I dislike Man cave too ! With that said I would prefer a combination of the two, just like you. All of these are very nice. 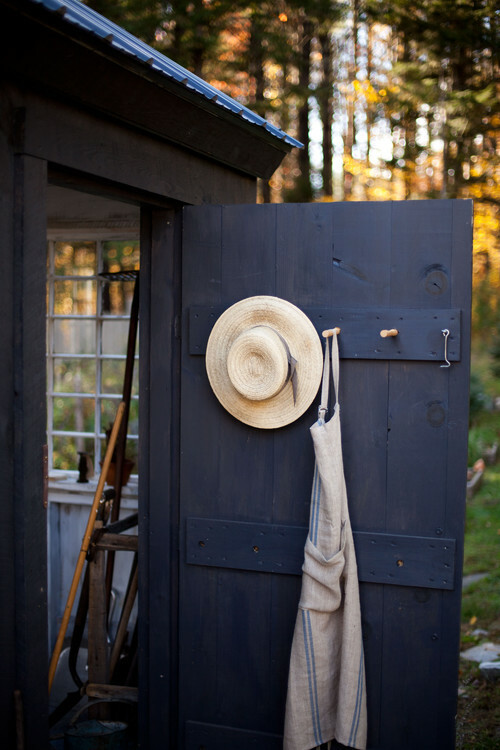 I love that new book on She Sheds….and I would love both…a potting shed/greenhouse to combine with a she shed! Make it a combination she’d. I guess it depends how much space (land/rooms) you have available, and what your priorities are! I realised I stopped pinning she/potting sheds when my son moved out and I took over his room, made it into my office/sewing room! I already have an extensive fibre art studio where once there was a garage. Since I am renting, there is only so much I can do. When I own my own property, I would like 3 distinct areas: a studio, a ‘she area’, and a garden/potting shed. Only this last would need to be a stand alone structure as I would prefer to incorporate the other two areas within my home. Looking forward to seeing what you will decide and how it will all look!